Who Uses Facebook in Your Area? Many small businesses compete in a relatively small geographic area, perhaps within 20-30 miles of their business storefront. Attorneys, restaurants, dentists, and banks are examples of these types of businesses. Local businesses need cost effective ways to reach potential customers, especially those local people who are most likely to become new customers. St Clair county is located in the southern portion of Illinois, in the eastern section of the St Louis metropolitan area. Largely rural & suburban, the county hosts a large Air Force Base, several large businesses, and many small to medium sized businesses. The county is in many ways a typical Midwestern area. The infographic below shows some of the demographic information that can be derived directly from Facebook about the people who use Facebook in a particular geographic area. Based upon the demographics below, it is clear that these Facebook users in St Clair County would be a good fit for many types of consumer businesses. Facebook business pages are by far the most common way to market on Facebook. Business pages are simple to build and free. Another, less common, method is to use Facebook ads. Facebook ads can be an even more effective way for business-to-consumer (B2C) businesses to reach local customers since these ads can be focused on specific demographic segments. For example a Wedding Planner might want to focus their ads on young women who are engaged. Chiropractors might want to focus on people interested in health & well-being. The demographic information above was gathered from Facebook by creating an ad campaign, selecting a geographic area (country, state, city, or zip codes) and then recording the audience size as you adjust the campaign targeting parameters. You will notice that "County" is not one of the geographic options available. 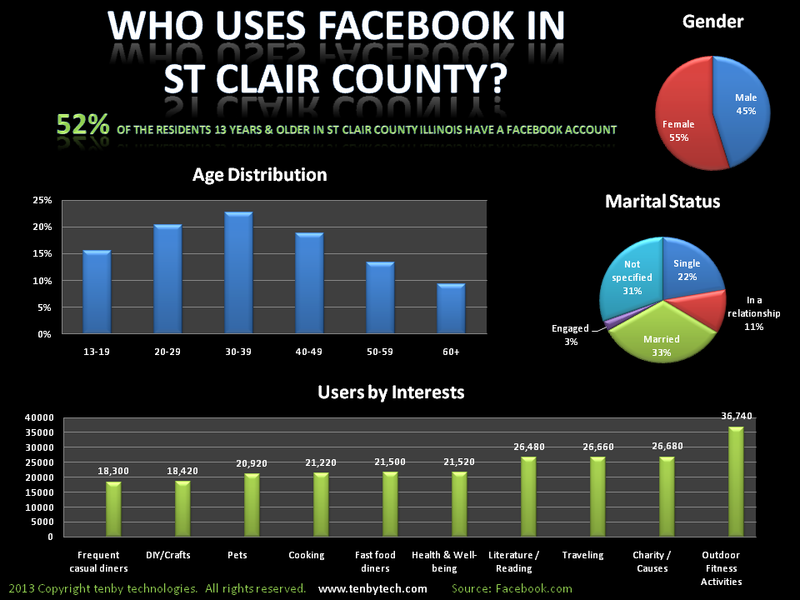 For our infographic we gathered the zip codes in St Clair County and entered them individually into the ad campaign. Perhaps you should consider using Facebook to identify consumers for your business.